For most people with diabetes, the main health concern is to keep blood sugar levels under control and avoid wild fluctuations that could cause health complications. Diabetic individuals may want to try psyllium husk as a way to lower blood glucose levels naturally. Aside from being useful in blood sugar control, psyllium husk supplements may benefit the health of diabetics in other ways as well. Psyllium husk, the outer layer of psyllium seeds, swells upon contact with water and acts as soluble fiber in the digestive tract. Psyllium husk can be purchased as loose powder or preformed into tablets, capsules or granules. Psyllium can be used for a variety of purposes, including the treatment of high cholesterol, irritable bowel syndrome, constipation and diabetes. Psyllium husk must be taken with water, because it can swell in the throat and cause an obstruction if taken without liquid. Individuals taking psyllium should also drink six to eight glasses of water a day. Individuals with diabetes have problems producing enough insulin or using the insulin they do produce to keep blood glucose levels under control. Consuming psyllium may be one way to help modulate blood sugar. In a 1991 study in the "American Journal of Clinical Nutrition," for individuals with non-insulin-dependent diabetes, taking psyllium with breakfast and dinner was found to reduce the rise in glucose after every meal during the day, including lunch. In addition to the blood glucose-lowering ability of psyllium husk, this fiber supplement may also lower blood lipid levels in diabetics. A 1999 study in the "American Journal of Clinical Nutrition" found that total cholesterol levels dropped by 8.9 percent and LDL cholesterol levels dropped by 13 percent in diabetic men who took a 5.1 g dose of psyllium twice a day for eight weeks when compared to men taking a placebo. LDL cholesterol is the kind that contributes to heart disease and builds up on artery walls to form arterial plaques. Because psyllium can lower blood sugar, you should talk to your doctor before using it, especially if you are on medication designed to lower blood glucose levels. Some people need to alter their dosage of medication when taking psyllium. In some diabetics, using psyllium may reduce the need for diabetes medication. Be careful to choose a psyllium product with no added sugars, because these could negate any positive effect that psyllium has on your blood glucose levels. 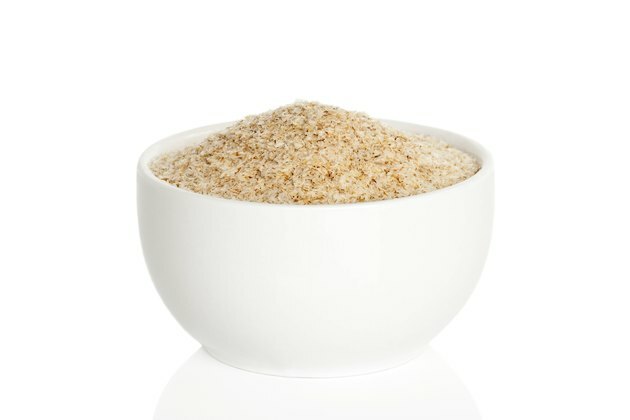 What Is the Difference Between Psyllium & Inulin Fiber?